It may sound strange and a little extreme, but I really do think that a good muffin is hard to find. Shops and coffee houses are full of massive muffins in their bags, all ‘freshly baked’ and ready to munch on the go. However, I generally don’t like them. I don’t consider myself a muffin snob but they tend to be heavy and stodgy and will sit in your stomach for at least a week after you’ve eaten one, and whats with the super-sizing? A muffin is supposed to be a little bit of cakey-goodness encased in its own little cup, not a week’s worth of calories in a monster sized mug. Am I going on a bit here? Sorry. Maybe I am a muffin snob after all. So when I come across a recipe that claims to be not just a good, or even a great muffin, but a perfect muffin, I just have to take up that challenge. What makes a perfect muffin? Thats all down to the opinion of the eater isn’t it (hence the claim of the ‘perfect’ muffin being such a bold statement) but in my humble 2 cents worth – and as this is my blog I have the power to bestow it on whosoever is reading – a perfect muffin is light, tasty, non-greasy, punctuated by a few fruity surprises, and not mammoth-sized. I am pleased to report that I was not disappointed. The recipe was blissfully simple, and yet so effective it makes whipping up a batch of these babies almost effortless. I daresay that I could do it in my sleep, or at least while sleep-walking/sleep-baking in the middle of the night while looking for a warm, comforting midnight snack. 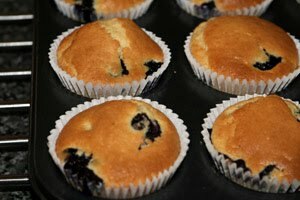 Just the smell of these little beauties baking in the oven is worth the trip out for stock of the last blueberries of the season. Oh, its the end of summer, shoot! I thought I’d managed to avoid facing that fact so well. Turning away from the sight of the leaves floating down from the trees and unconsciously adding another clothing layer so that I don’t notice that bite in the air when I leave the house for work in the morning. Stop. Rewind. Go back to summer please… I’m not ready to say goodbye to light evenings and summer berries. Luckily I have these little beauties to soothe me and remind me that autumn is the season for a host of new, fresh ingredients and an extra layer won’t kill me. I’ll just have to run in the dark with a silly headtorch and then cuddle up on the sofa with a blanket, a glass of red and a warm body next to me and enjoy having an excuse to do all that. I guess I am jumping the gun. Hey, it was 18 degrees today for a couple of hours, almost tropical, hahaha. If my South African friends heard that they’d laugh their heads off for the whole 5 minutes of their measly winter. Miss some things about Africa. However, I digress, this is supposed to be a food blog. 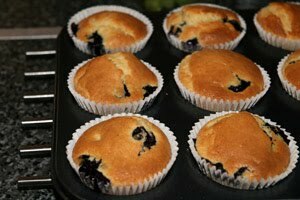 So if anyone is reading this and likes a good muffin, give these babies a go. you won’t regret it. Thank you Deb at Smitten Kitchen for your inspiration, my life would be a whole other level of dull without you and your bright pictures and happy words. Preheat oven to 375°F. 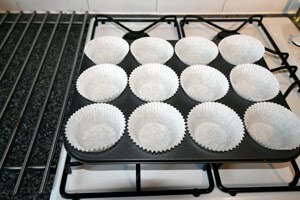 Line a muffin tin with 10-12 muffin cases or spray each cup with a nonstick spray. Beat butter and sugar with an electric mixer until light and fluffy. Add egg and beat well, then sour cream and zest. Put flour, baking powder, baking soda and salt into a sieve and sift half of dry ingredients over batter. Mix until combined. Sift remaining dry ingredients into batter and mix just until the flour disappears. Gently fold in your blueberries. 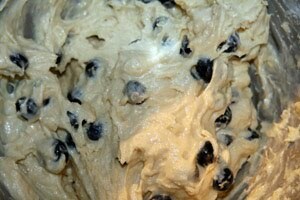 The dough will be quite lovely and thick, more a cookie dough than a batter. Fill the muffin cases/tin. You’re looking for them to be about 3/4 full, nothing more, or you’ll have an overflowing mess. 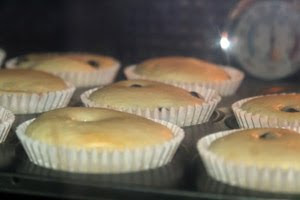 Bake for 25 to 30 minutes, until tops are golden and a tester inserted into the center of muffins comes out clean. Let cool on rack (ha), or munch 1 (or more) while decadently warm.